Summer here in Central Texas is soon coming to an end, and everyone is looking forward to cooler temperatures, beautiful fall foliage, and the start of the holiday season. Unfortunately, what is not coming to an end is our need for foster homes. It seems that every year, about this time, we send out a plea asking former adoptive homes, former foster homes, and our supporters for their help. We often worry that such repeated pleas will eventually find themselves quickly dropped into the trash bin. If you're reading this, most likely you have one or more Golden foot-warmers nearby. Take a moment and think about what it took for that joyful foot-warmer to have found his or her way to your home (and feet). About a dog who lost their owner from illness. We need foster families badly. Our Goldens need you. The ring on this Circle of Love is very close to being torn apart. GRR continues to take in more dogs than we have foster homes to handle. We're asking for help. It's not the first time, and it certainly won't be the last, but the urgency doesn't change. Our immediate needs are for foster homes willing to take a heartworm positive dog through treatment, or take in the Goldens we are getting in from the Palm Valley area and who typically have treatable respiratory illnesses. We will accommodate whatever parameters you put in place – you tell us what you can handle. We will make it happen! If you would like to help us get a Golden to the final ring in their Circle of Love and are already approved, please contact us OR fill out a foster application here. Note: the application for fostering is the same as for adoption. 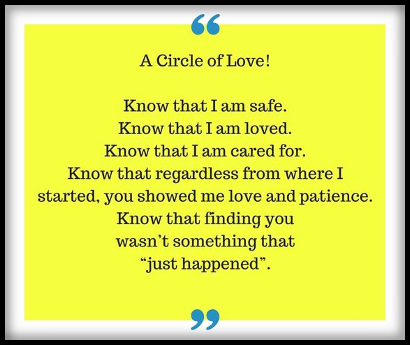 And the last ring of the Circle of Love for our Goldens? Know that I am safe. Know that I am loved. Know that I am cared for. Know that regardless of where I started, you showed me love and patience. Know that finding you wasn't something that "just happened". Once your family has decided, together, to foster a Golden Retriever, please fill out the adoption application (the applications for adopting and fostering are exactly the same, since many foster families do eventually adopt one of their foster dogs). You should hear back from a volunteer within a few days. If you have any questions before filling out the application, please call our hotline, at 512-659-4653, and we'd be very happy to discuss fostering with you. Thank you! Why are Foster Homes used? As an ethical rescue organization, GRR is committed to being truthful in disclosing any behavioral or medical problems our dogs may have to potential adopters. Our Foster Homes help us find these. This policy is also practical -- we want adopters to make an informed choice about the dogs so the adoption can be a permanent and happy one. The observations and recommendations of the Foster Family are crucial to the continued success of the GRR organization in placing rescue Goldens. Why should I become a Foster Parent to a Golden Retriever? Foster Care will culminate in a new beginning for a deserving Golden Retriever. By fostering a dog, you get to know the dog. Since you know the dog best, you help us determine the best new and final home for that dog. Each time you help match a displaced Golden Retriever with just the right family, you will know you have done something good, caring, helpful, and lasting. You will have been the major player in helping a wonderful Golden Retriever find a happy life. Providing love and security to a special Golden Retriever at an often-difficult time in his or her life. From an hour a day to however much time you can spend with the dog. These dogs just want to be loved. If healthy, a Golden Retriever normally stays in Foster Care from two weeks to two months. Occasionally we have dogs that need longer-term care. What if I can't keep the Foster Golden any longer? While it is best for the dog to stay in one home while in Foster Care, we realize that plans sometimes change unexpectedly. GRR will work with you to find another Foster Home to take the dog. May I choose which dogs to foster? You may certainly set limits on the kinds of dogs you foster. If you are asked to foster a dog that doesn't seem right to you, you can decline. If a foster dog you have accepted proves too difficult to handle, it can be placed elsewhere. Will I become attached to my Foster Golden? Usually, but when you meet the people who will provide a permanent home for the dog you have helped rescue, you will feel the satisfaction of seeing him move to a new and better life. May I adopt my Foster Golden? Do I have to be home all day with the Foster Golden? No. Many of our foster families are employed full or part-time away from home. However, our first concern is safety: for you, your family, your own dog(s), and the rescue dog. Therefore, we suggest that any time you are unable to directly supervise the Foster Golden, he must be confined to a secure area. You can crate him, baby-gate him into one or two rooms, or leave him loose in the house -- depending on what works best for you and the dog. A fenced yard is preferred for all dogs less than 7 years of age. Foster Goldens must NEVER be allowed to run free. If your yard is securely fenced, the Golden may be exercised there, off-leash; but outside the yard, the dog must be on a leash at all times. What if I have questions or problems with a Foster Golden? All Foster Homes receive GRR's Foster Care Manual, which provides guidance on routines and special aspects of fostering. Our Foster Home Coordinator and Adoption Coordinator are available for telephone consultation on problems not covered in the manual. GRR members are organized around the cause of helping this truly exceptional breed of companion dog and they will help you too! How much does it cost to Foster a Golden Retriever? Any damages the Foster Dog causes. On the other hand, the Foster Golden's veterinary expenses and medications, including heartworm preventative, will be paid for by GRR unless you want to donate these expenses to GRR (they are tax deductible). Any more information on fostering? Yes! See our brochure on the topic. If I can't be a Foster Parent, is there another way to help? If you are interested in any of these activities, give us a call, or email us. We will be glad to have your help and you will be glad you got more involved in sharing your love of Goldens! To get started fostering right away, fill out an application and be sure to indicate you are wanting to be a foster home.